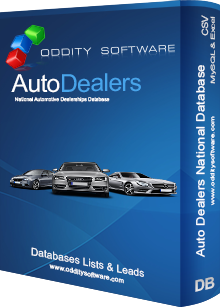 Download our Auto Dealers (National) Database List. 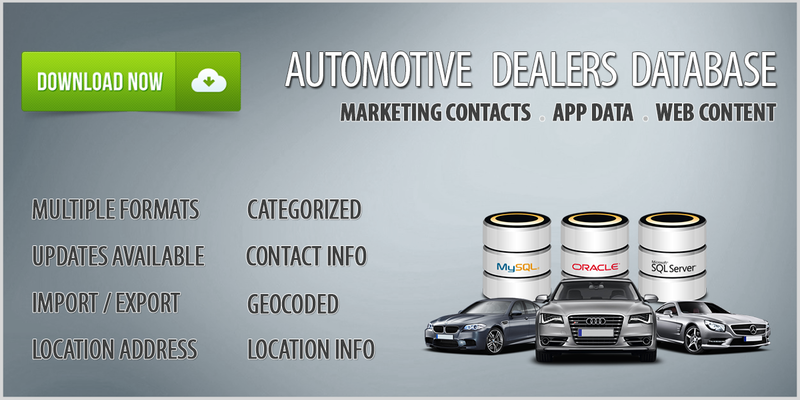 This database contains 109,610 records of Auto Dealers locations and Car Lot leads. This Automotive database can be downloaded in CSV, MySQL and many other formats. This Database is updated every 120 Days. 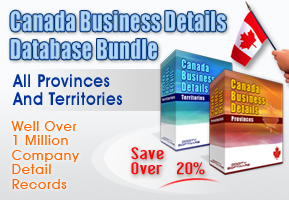 Master License holders can purchse updates for this database for $25.00. Our Auto Dealers (National) Database offers accurate, real-time access to a national database of potential auto dealer and car lot leads. It lists names, physical addresses, phone numbers, emails, and more. Everything you need to know is included within this comprehensive listing. Since one of the largest challenges that any business can face is the ability to generate new leads in an effort to locate customers, access to an all-inclusive database of potential clients who can benefit from your services is important. With an up-to-date database of auto dealers and car lots, you know that you have the correct contact information, eliminating any concerns that you might have regarding outdated data. Channeling your marketing efforts into this productive avenue is going to lead to the greatest number of potential leads and the largest possibility for increased revenue. Using this comprehensive database of potential customers can assist your direct marketing efforts greatly. With an accurate database of potential customers, you can channel your marketing efforts on your targeted audience easily and with a greater incidence of success. The information has already been gathered for you, leaving you to conduct your marketing campaign via email communication, phone calls, or postal mail. Not only does using an up-to-date collection of names and contact information save you time, effort, and money, but it also keeps your reputation intact. How foolish does it look to send an email or postal letter addressed to the wrong individual? It's important to keep your database current so that you can avoid this particular scenario. Oddity's Auto Dealers (National) Database is updated every 90 days, minimizing the risk of using inaccurate information. With business to business communications, your efforts are limited to those companies within your targeted industry and location. Therefore, the importance of having access to a longer list of potential contacts is even more important when you begin to build a focused marketing plan. The Auto Dealers (National) Database includes listings for more than 111,000 establishments, providing you with more than enough contacts to increase your customer database and profits. With the evolution of modern marketing methods, such as via email and social marketing avenues, businesses like yours have immediate access to potential customers. With our Auto Dealers (National) Database, you also have the contact information you need to develop a successful marketing campaign with less fuss, effort, and expense than traditional advertising strategies. In fact, due to the ease of promoting what you have to offer to the list of contacts included within the database, you can easily launch a successful drip-marketing campaign, sending out emails once a month to each auto dealer or car lot on your list. While many no extra steps need to be taken - an added incentive for people to respond. They do not need to pick up the phone to call you or compose a letter to send you. Email marketing is one of the quickest ways to obtain feedback from potential customers. It's quick, painless, and relatively reliable. Oddity's Auto Dealers (National) Database provides a fast and reliable way to obtain up-to-date contact information on auto dealer owners and car lot executives, offering the convenience of providing all of the information you need to cultivate new leads in a single spot. Your marketing campaign becomes simplified since you no longer need to conduct a lengthy search to obtain contact information. This is valuable time that can be spent better elsewhere in your daily business operations. Our Auto Dealers (National) Database simplifies advertising strategies, while positioning your company in a place to expand its operations while increasing sales.